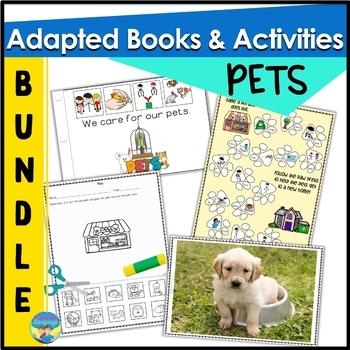 This pets themed set is chock full of activities for multiple language and literacy skills! Each of the three adapted books has a game and multiple worksheets, which are at varied levels to meet the needs of mixed groups. 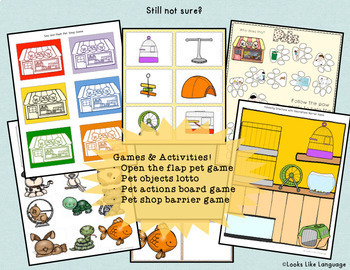 The 4 games can be played to elicit any goals and the colorful photos are great for discussions or sentence production! 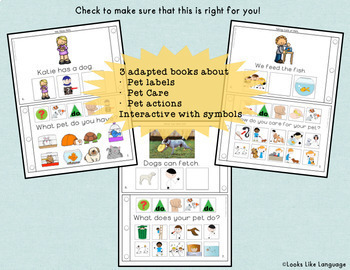 - We Have Pets: a 7 page adapted book for labeling common pets in a sentence script. - What Can Pets Do? : a 7 page adapted book for filling pet actions into a sentence script. 4. 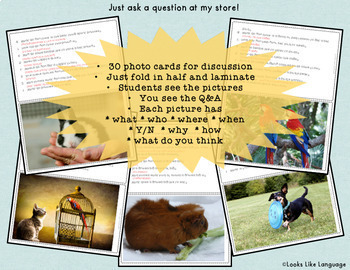 Discussing pets with 30 colorful photo cards. Each has 8 questions: what, who, yes/no, where, when, why, how, and a thinking/opinion question. * Thematic units are so fun for my students and me! :) Thank you for creating such a versatile resource with so many activities. * Love this unit! everything i needed to talk about pets. thanks! * Such a fun set of books and activities!